If you’re intending to travel in and around New Zealand in one of our Campervan Rentals, you may not always have a vast choice when it comes to foods to choose from. We’ve taken the time to put to together a few meal ideas that you’ll be able to make on your gas cooker while exploring The Land of The Long White Cloud. Using a large frying pan, place half of the olive oil on high. Cook the rindless bacon for 4-5 minutes until it’s crisp on both sides, before removing it from the pan and setting it aside. Give the frying pan a good wipe. Reduce the heat of your gas cooker to medium, before pouring the remainder of your oil into it. Now fry your eggs for 2-3 minutes until the egg whites have set. 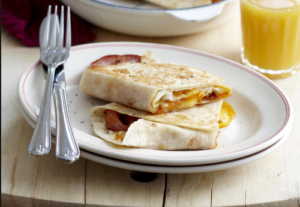 Take a single tablespoon of tomato chutney and spread it down the centre of each tortilla, before adding ¼ of the mozarella cheese, a slice of rindless bacon and an egg. Roll up the tortilla and repeat the procedure using your remaining ingredients. Place the tortilla wraps back into the pan and cook each side for 1-2 minutes, until it is warm enough and the cheese has melted. Pasta dishes are always a cost effective means of having a good wholesome carbo-loaded meal. 300 grams of chicken breasts, with the skin and it’s bones removed. 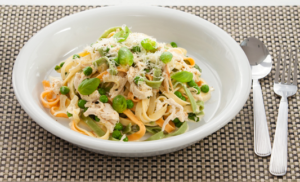 By following the packet instructions – Cook the fettuccine once cooked, drain it. Using i supplied frying pan, heat the olive oil, sauté the onions, garlic and chicken until the chicken is cooked. Add the peas, stock and cream and simmer for 1 minute. Add the cooked fettuccine, shredded basil leaves and grated parmesan. Only simmer for a few minutes until the pasta is heated through and the sauce is creamy. Season well and serve with the extra parmesan.if needed.